Find out what we thought about Royal Caribbean’s Ovation of the Seas after our overnight ship visit. On the 12th April we were given the privilege of attending a ship visit on the Royal Caribbean Ovation of the Seas. As we eagerly anticipated the visit in the days and weeks leading up to the 12th, we saw that chatter about the Ovation was simply everywhere across social media, the news and in cruise industry publications. But does the Ovation live up to its hype? Find out with our thoughts on each of the categories below and check out our photo album on Facebook. We wanted to put this first and foremost, because the service on board was really quite incredible. Even before boarding, we were welcomed into the port by a representative who checked us in very efficiently with an iPad. As we were boarding we were ushered through by friendly team members before stopping to pose for the traditional boarding photo – there was 15 of us so you can imagine the commotion trying to get organised! As we stepped foot onto the ship, again we were welcomed by the Royal Caribbean ship staff and some of the HQ team who were on board for the launch. Wherever we happened to stop for a drink or a bite to eat – or even if we were trying to just navigate our way around the mega ship which is the Ovation, there was always a friendly face there to help. What we will say about the Ovation is that the choice of staterooms on board is second to none. Whether you’re a solo traveller, group, family or couple – you’ll find a stateroom to suit your requirements and your budget. The staterooms are decorated with rich plum and blue tones, tastefully appointed with art, flat screen televisions and sleek dressing tables. The bathrooms are contemporary and spacious and have complimentary toiletries which is always a plus. Tea and coffee lovers will rejoice in the knowledge that there are tea and coffee making facilities in each of the staterooms – something which isn’t widely available through most ships in the cruise industry. There’s also a mini bar should you ever feel thirsty but you’re not much in the mood for leaving your cabin. What we really need to mention here are the beds – because they are just so comfy! All 15 of us (aged from 21-50) all whole heartedly agreed that they were amongst the best we’ve ever slept on. There’s also super plush towels – not the crispy kind you sometimes find in hotels! We were lucky enough to stay in a Balcony Stateroom and we’d argue that it was remarkably bigger than most London hotel rooms. On the Balcony there are two loungers, perfect if you want to catch some rays in private. The ship has a smart-casual dress code which gives the ship an air of excitement that something special is happening – which is nice because you’ll be on holiday after all! There’s art work adorning most of the walls and some incredible floral displays give the ship the ambience of a luxurious hotel. In fact, the Ovation of the Seas has 11,000 pieces of art around the ship, from the selfie inspired shots you’ll find in the lifts to the Smart Art that moves in the entrance foyer. Two of the pieces that take centre stage however are The Red Thread created by Chinese artist Bielu Liu and of course the undeniably cute 33ft Panda and Cub which was commissioned to UK based artist Jo Smith. The installation is perched on the roof of SeaPlex on Deck 15. You might be wondering ‘Why a Panda?’ and this is because the Ovation will be based in China, where natives consider the Panda to be a symbol of good luck and a national treasure. 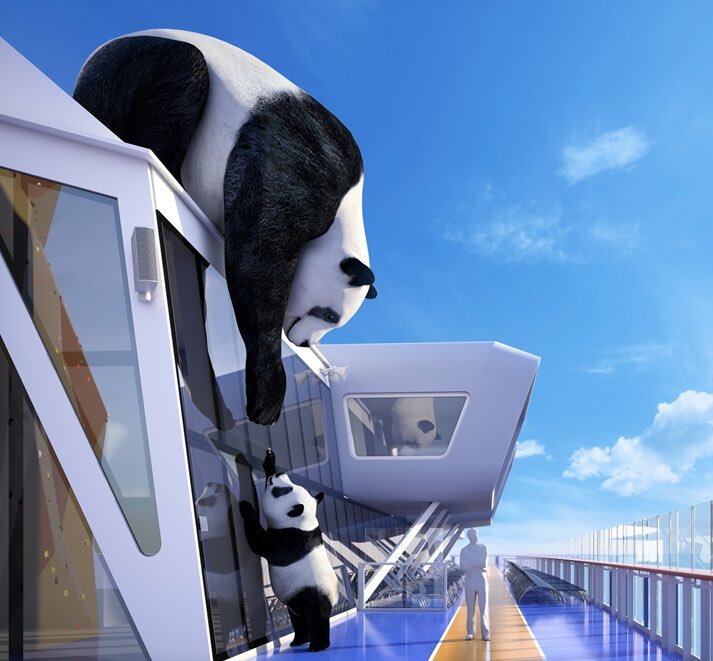 Some also believe it’s because of the recent connection that Royal Caribbean have made with WWF (who’s logo is a Panda) to work together to protect marine life. Chic (Deck 3) – Where the freshest ingredients are evolved to the height of contemporary cuisine. The Grande (Deck 4) – The Grande Restaurant is a luxuriant nod to a bygone era. When dining was not a task, but a time-honoured ritual, when you dress for a date with an unforgettable dish. Silk (Deck 4) – Weave your way through vibrant tapestry of pan-Asian flavours as diverse and nuanced as the Far East itself. American Icon Grill (Deck 4) – American Icon Grill is the classic American road trip with some of your favourite all-American dishes. Coastal Kitchen (Deck 14) – Exclusively for Suite guests, a fresh fusion of California cool and Med-inspired taste. Cafe Promenade (Deck 4) – Coffees, snacks and pastries in the morning and sandwiches and cookies throughout the day and night. Sorrento’s (Deck 4) – Authentic New York pizzeria. The Cafe@Two70 (Deck 5) – An easy grab ‘n’ go gourmet marketplace where your selections are packed up picnic-style, so you can enjoy them anywhere onboard. Windjammer Marketplace (Deck 14) – A global culinary pavilion that invites you to explore the world, dish by dish. Plus a new 24-hour station, The Grill. SeaPlex Dog House (Deck 15) – Serving up traditional hot dogs, brats and sausages, plus a variety of toppings. La Patisserie (Deck 4) – A quaint and cosy coffee house and pastry shop in the French tradition ($). Michael’s Genuine Pub (Deck 4) – Award-winning chef Michael Schwartz brings you delicious yet uncomplicated pub fare, plus his namesake craft beer ($$). Solarium Bistro ( Deck 14) – Explore a menu of inspired, sumptuous dishes that embrace healthful living through healthy eating. Kung Fu Panda Noodles (Deck 14) – Follow your instincts to this family style noodle shop, where bold flavours give your taste buds a satisfying Kung Fu kick. Colourful characters from the DreamWorks Animation film come to life as you dig into scrumptious dim sum delights, savoury noodle bowls and traditional Chinese desserts. Chops Grille (Deck 5) – Royal Caribbean’s hallmark steakhouse brings contemporary flair to time-honoured grill favourites. Izumi (Deck 5) – Sushi, sashimi and more, all made-to-order with intense flavours, the best ingredients and impeccable presentation ($$). Jamie’s Italian by Jamie Oliver (Deck 5) – Celebrity Chef Jamie Oliver presents a menu of rustic Italian favourites, handmade with fresh, seasonal ingredients ($$). Wonderland Imaginative Cuisine (Deck 5) – The Royal Caribbean chefs twist the kaleidoscope to invent fantasy gourmet dishes, magical elixirs, and more never before seen fare. The Ovation features some fantastic places to grab a drink and relax. What we love about the bars and lounges on board is that each one has it’s own ambience and style. The Schooner Bar had a traditional nautical vibe with brass finishes, cascading rope nets and even a tall ship wheel, the Vintages is the go to place for a glass of fine wine on board whilst Boleros is infused with Latin passion showcased through signature drinks and live Latin music. Perhaps the most famous of all the bars on board however is the Bionic Bar. Here you place your order for a drink on a nearby tablet device and then you watch in wonder as two bionic arms work away under a ceiling of optics to create your drink of choice. Casino (Deck 3) – Featuring state of the art slot machines, luxurious gaming tables, tournaments and even free gaming lessons if you’d like to learn how to play. Art Gallery (Deck 5) – Original artwork to browse, admire and purchase. Library (Deck 6) – Located within Two70 is a wide variety of books available to check-out. The Workshop (Deck 6) – Located within Two70, a bright, creative room dedicated to crafting sessions like jewellery making, scrapbooking and more. Solarium (Decks 13 & 14) – Adults only indoor/outdoor retreat with cascading lagoons and an indoor pool. Pools (Deck 14) – Fresh water pool area and whirlpools. Running Track (Deck 15) – Run laps whilst taking in the view. North Star (Deck 15) – Enter into the jewel-shaped capsule and gently ascend 300 feet above sea level, where you can take breathtaking views of the ocean, the ship and ports of call. Rock Climbing Wall (Deck 15) – The rock-climbing wall is surprisingly Royal Caribbean’s most popular feature. Equipment, shoes, helmets and harnesses are provided. Vitality at Sea Spa (Deck 15) – Offering internationally acclaimed spa brands such as Elemis, Bliss, La Therapie and Ionithermie, the spa offers advanced technology and hands on solutions for every face and body. Indulge with massages, wraps, facials and media-spa treatments. SeaPlex (Decks 15 & 16) – This is an indoor sports zone with a full size basketball court, roller-skating, a floating DJ booth, a circus school and bumper cars. Above the main floor there are four activity rooms with live global video gaming from XBOX and more. Vitality at Sea Fitness Centre (Decks 15 & 16) – Powered by Technogym, you can work out on the latest cardio and resistance equipment or try Flywheel, TRX or Beach Bootcamp. FlowRider (Deck 16) – Whether you’re boogie boarding or surfing, the FlowRider is great fun for all skill levels. Ripcord by iFLY (Deck 16) – Take flights and enjoy the unparalled exhilaration of skydiving in a vertical wind tunnel. Escape the Room – You’ve likely heard of these experiences where you’re locked in a room with several other people and you have to work together to solve the puzzles to find the key and escape? Either way, this experience is a must…. just try to keep a cool head! Whilst children and teens can get involved with most of the activities mentioned above, there are a few features on board designed just for them. Adventure Ocean is an incredible facility with a variety of playrooms which are packed with toys, slides, books and computer games that will keep them occupied for hours on end. The childcare team are fully qualified and they’ll involve kids in activities that will encourage them to engage with one another and make friends of their own during their time on board. The H2O Zone on Deck 15 is where little ones can splash around as much as they like in mini -sized slides and pools, whilst for teens they have their own Living Room where they can hang out, listen to music and chat or come evening there’s the Fuel Teen Disco – their own dedicated night club where they can dance and have fun. Kids and teens alike will enjoy the Challenger Arcade with its flashing lights and timeless arcade games which give them a chance to win tickets to earn great prizes! If you’re not tired out after a fun-filled day getting involved with the on board activities or feasting on the fabulous food, then there’s some great entertainment to keep you on the edge of your seat. The Royal Theatre is split over three decks and showcases Broadway productions. The current show is ‘The Dream’ and there’s not much information out about it yet because it’s completely new! In Two70 there’s 270-degree panoramic views with floor to ceiling glass windows, dancing robotic screens, dancers and acrobats. For something a little more chilled out, there’s the outdoor movie screen, where you can watch first-run movies under the stars. So, does the Ovation of the Seas sound like a ship you’d like to holiday on? If you have any questions for us, ask away in the comments below or on our Facebook or Twitter pages. If you’d like to find out more on the Ovation, check our dedicated web page which also features the sailing dates. Great review. It is interesting most other blog did not mention the escape room.